A third 2!i x i inch phenolic board is added to accommodate the monitor oscillator and loudspeaker. This Me inch board is secured to the rear of the original base with two #4-40 screws, A Ji x % x 4 inch spacer holds the new board out so that the VA inch loudspeaker will not interfere with components on the original rear board, A new cover which is inches longer in the front to-back dimension completes the mechanical construction of the new-y added keying monitor. As many readers concluded* the dual iok potentiometer is non-standard and, therefore, must be replaced with another value for the speed control in the free-running multivibrator. 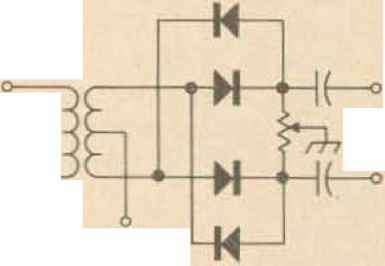 One solution which provides a two-fold advantage is to use a dual 10k potentiometer. First, a standard control is provided. Secondly, the small amount of fixed resistance w hich is placed in series with each potentiometer prevents the maximum speed from exceeding 50 WPM. Hence, the elusive 5,8K, !i watt resistors which appeared in the photographs, now have a logical place in the schematic diagram. The two ! 50K filler r esistors in the power supply alas were wrongly labeled as 150K which is about 1,000 times their proper value. Two 150 ohm, Yz watt resistors should be used in this application. >ue to the very small load on the 6 volt supply, we find that the +6 is more nearly +9, especially when generous filter capacitors are used (peak voltage = 1.4 times RMS), A 750 ohm, Ji watt bleeder resistor across the plus supply w ill tame this voltage and provide more realistic biasing of the PNP transistors as well. One of the better insulators known to elec tro-chemists is aluminum oxide. And that's just what we have on the paddle contacts in a very short period of operation. Although brass screws may be used for the adjustable contacts, it is still desirable to install some form of better contact material on or in the paddles themselves. One very successful method is to use a small piece of silver solder as a rivet and "peen"' it into Yaz inch holes which have been drilled in line with the adjustable paddle contacts. After the silver has been hammered snugly into position so that it tightly fills the drilled hole, it should be smoothed off with a verv fine file or emery cloth. In order to provide better electrical connections through the hinge joints, a spring was added to contact the ends of the hinge rods. The spring w as made of spring brass and held in place by the last two screws of the keyer mechanism. The contacts were cut from a piece of 134 x ?4 inch spring brass. Two #27 holes were drilled and %2 inch slits were sawed in a pattern, as shown. Try not to distort the spring while fabricating it, in order to keep the contact snug on the hinge rod onds. Once these modifications are made to your Kleiner Keyer, you will find greatly improved reliability and pleasure in its operation as we have here at W4BRS.